I am excited that Android 2.2 (aka Froyo) has been announced at Google I/O. Especially the Dalvik JIT compiler directly benefits all my game engines with deeper search. And yes, the 5x improvement reported for checkers in the Android 2.2 highlights page refers to Checkers for Android! 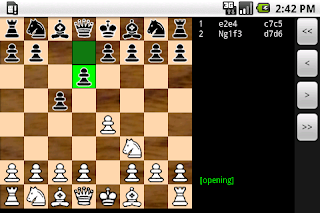 I am working on extending Chess for Android with full replay buttons. This will remove the somewhat arbitrary restriction of only an 8 half-move undo. Furthemore, it allows replaying older saved games and experimenting with different continuations. Here is already a quick preview of the new landscape and portrait layout I am planning to use. Early feedback welcome! I added a much requested feature to Chess for Android: the ability to load and save games (other than just the one in progress). To use this feature, long-press anywhere in the notation window to get to a menu for exporting the game to clipboard as PGN or FEN or, the new feature, for loading and saving games as file. As illustrated below, after pressing "Save Game to File", a pop-up window asks the user to pick a file. Initially files are empty, but after saving they get marked with the date and time of the last stored game. Simply pick a marked file to overwrite or pick an empty file, as done below for file 3. Loading a game is done in a similar manner. Today I was prototyping a distributed worker pool at work which needed some test input, and this gave me a good excuse to compute perft for checkers for depth 21 (one deeper than results I posted a while back). The perft breakdown per move (called "divide") from the start position for depths 18 up to 21 is shown below.